Each year hundreds of lives are lost... thousands are injured... and millions of dollars of property damage occurs because of preventable recreational boating accidents on U.S. waterways. Too often pleasure outings turn tragic. You as a boat operator, passenger, or concerned individual can make a difference. The U.S. Coast Guard hopes that you're never involved in a boating accident. But if you are Federal Law requires that you file an accident report. Human error remains the leading cause of boating accidents. Learn the rules, your responsibilities, and how to safely operate your power, sail, or human-propelled vessel. Learn how a free vessel safety check can help you navigate through problem situations. The U.S. Coast Guard estimates that life jackets could have saved the lives of over 80 percent of boating fatality victims. Accidents can, and do happen with terrifying speed on the water. There's rarely time to reach stowed life jackets. As the boat operator you are responsible for the safety of your passengers. 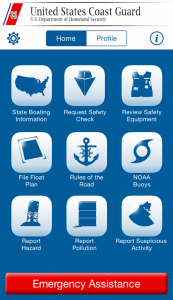 The U.S. Coast Guard challenges you and your passengers to wear your life jacket all the time while underway. Going Paddling Know your limits! Whether you are sea-kayaking, standup paddle-boarding, canoeing, or kayaking, check out these safety tips from the American Canoe Association. Why should you take the time to prepare a float plan? The answer is simple... there are just too many facts that need to be accurately remembered and ultimately conveyed in an emergency situation and it is a lot easier to find you if someone tells searchers when and where to look. Alcohol is the leading contributing factor in fatal boating accidents. The risk is high and the consequences severe know the dangers and avoid being a victim of Boating Under the Influence (BUI). Information about the performance of shallow water boats. View the BEWARE Boat Propellers... A Hidden Danger.